The following article is co-authored by Donna Salvatore, CEO of Megalytics and Candyce Edelen of PropelGrowth. It is derived from a research study on the coworking industry conducted by Megalytics in 2H 2018. The nature of work, particularly in the knowledge economy, has changed dramatically in the past decade. New trends in the rise of entrepreneurialism and an emerging contingent workforce is changing both where and how work is done. In addition, technology now enables people in the knowledge economy to do their work from virtually anywhere with a high speed Internet connection. The US coworking industry has helped to facilitate this shift by providing shared office space; flexible, short-term lease options; and scalable commitments to businesses and individuals. Growth is happening most rapidly in markets like New York, Chicago, and Los Angeles, as well as most major international markets. Growth has been explosive recently. According to Emergent Research, approximately 70 coworking spaces opened between 2006 and 2009, typically in major urban centers. By 2016 that number had reached around 11,000, and by 2017 at least 14,000 spaces were in operation. Coworking currently accounts for less than 5% of the total US office market, but demand for coworking spaces is at unprecedented levels. The Global Coworking Unconference Conference (GCUC) estimates that there were 1.74 million people using coworking spaces in 2017 and projects that to grow to 5.1 million in 2022. This represents an average annual growth rate in demand of 24.2% from 2015 to 2022. In contrast, they project actual spaces growth at 16.1% average annual growth over the same period. This is likely to create a shortfall in supply, but that will be partially mitigated by the industry’s ability to increase the members served per square foot. Providers are also adding more square footage to existing sites and increasing the size of new coworking facilities. Much of this growth is being driven by the steadily accelerating “gig economy.” It’s difficult to calculate exactly how much of the workforce is independent or contingent, because different studies use different criteria to define independent workers. But there is no question that this segment of the workforce is growing. In May of 2017, Intuit reported in an earnings call that “The gig economy…is now estimated to be about 34% of the workforce and expected to be 43% by the year 2020.”This number represents all people who freelance, including Uber drivers, moonlighters and full-timers. So not all will be adding to the demand on shared space. However, if these industry forecasts are accurate, the demand for shared space will continue to follow this trend. 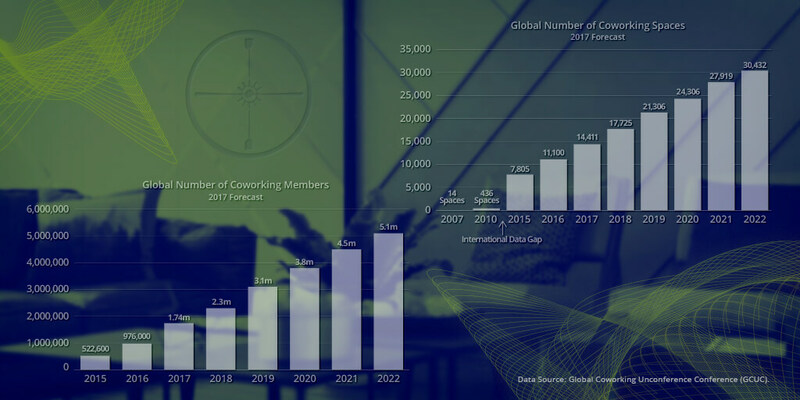 By the end of 2018, there could be as many as 18,900 global coworking spaces according to deskmagor 17,725 spaces according to Emergent Research. But growth in the gig economy and startups is not the only trend driving coworking growth. Large corporations like IBM, Verizon, KPMG and many more are moving entire teams into coworking spaces. Enterprise memberships at WeWorkhave increased from 11% of total memberships in 2016 to 23% in 2017. As of 2017, 22% of the Global Fortune 500 has joined WeWork. This gives these large firms several advantages that they can’t obtain on their own campuses. By working side by side with new startups, these firms’ teams can rub shoulders with some of the newest innovators. This enables them to stay in tune with developing industry trends and changing demands. Coworking also allows them to establish locations where they have access to talent pools not available in their existing locations. The short-term, flexible leases in coworking spaces also allow these Fortune 500 firms to mitigate real estate risk and substantially reduce costs. It also gives them the ability to quickly scale back in the event of an economic setback. However, this benefit poses a risk to the coworking industry. Some of these large corporations are swallowing up massive amounts of space in existing and new coworking facilities. They’re signing short-term leases, while the coworking companiescommit to10 to 15 year leases. A lack of diversity in clients increases a coworking company’s exposure to the risk of an economic downturn.In the event of a downturn, if an established company needs to reduce spending, it is more likely to reduce commitments to temporary coworking spaces or multi-campus projects to avoid defaulting on existing leases for corporate headquarters, regional offices, distribution centers, etc. This could result in substantial vacancy rates. While most coworking facilities need only 60% occupancy to cover their operating costs, a downturn could result in the need to lower prices to maintain occupancy. Prolonged periods of low rental rates and low occupancy could drain cash from coworking businesses that are already struggling to limit operating expenses, pushingpreviouslyviablebusinessesoutofoperation. IWG, previously known as Regus, is the only large coworking player to go through a major economic downturn. They grew rapidly in the 1990s on a wave of high-hope investment, only to seek bankruptcy protection after the dot-com bust. Can Coworking Survive an Economic Downturn? The Megalytics team recently published a Coworking Industry Analysis that addresses the question: “Is co-working a viable alternative to renting space traditionally, and can it survive an economic downturn?” This report provides detailed insights into the coworking trends. The studyaddresses new non-traditional lease structures between landlords and coworking operators. It compares the coworking trends to traditional Commercial Real Estate industry trends in order to determine whethercoworking will continue to be a viable alternative leasing option. The study analyzes key qualitative and quantitative industry indicators, business performance benchmarking, leasing strategies, national economic trends, expansion plans, and corporate consolidation between traditional Commercial Real Estate models and emerging companies in the Coworking Industry. The report also addresses WeWork’s scale within the industry, as well as the opportunities and threats that may impact the company, and the industry, in the future. While the report is available only to Megalytics subscribers, you can access a free 5-page Executive Summary, which can be downloaded here (registration required).